Has Manny Pacquiao’s Camp Lost Confidence in His Skills? It is crazy to think that after eight years of him dominating boxing folks would question Manny Pacquiao, but that is exactly what&apos;s happening right now. Despite the fact that his last legitimate loss came in 2005, and despite the fact that he has consistently challenged the best foes the sport had to offer, apparently people within Manny&apos;s own camp are now wondering whether or not he still has it. And as anyone in any sport can tell you: when your own camp starts losing faith, that is the first sign of trouble. Since that infamous 2005 loss to Erik Morales (which was subsequently avenged), Pacquiao has been challenged by one opponent and one opponent only. Juan Manuel Marquez, the man who he will fight for a fourth time on Dec. 8 of this year, is the lone person who can legitimately lay claim to even kind of throwing Manny off his game. Stylistically, as has been proven time and again, Marquez poses challenges to the Filipino champ that no one else in the sport does. And yet, in spite of that, even he has been unable to capture a victory in three separate tries. (The end result of the last go-round is disputable, but not in the way that the Timothy Bradley bout was.) Think about that. The only person who has even threatened Pacquiao in over seven years hasn’t even been able to beat him. Is that the sign of someone falling off? Of course not. But beneath the surface, things are vastly different for Pacquiao as he prepares for his Dec. 8 match with Juan Manuel Marquez in Las Vegas. There is a palpable sense of concern within his camp that he&apos;s not the same rampaging guy he was in 2008 and 2009, when he literally destroyed the likes of Ricky Hatton, Oscar De La Hoya, Miguel Cotto and David Diaz. And Pacquiao, for his part, hears the questions. 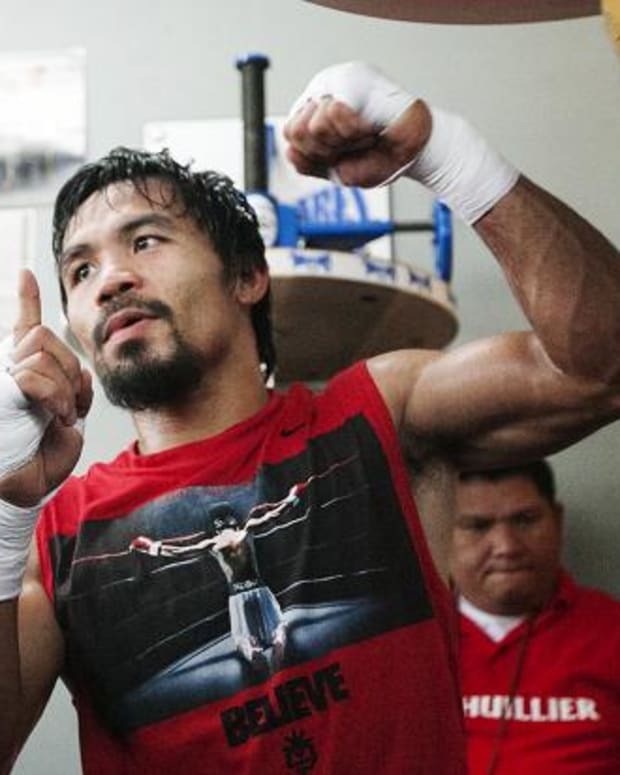 "What I&apos;m trying to do in this fight is end any doubts," Pacquiao told Yahoo! Sports. "I worked on the conditioning so hard so I could do whatever I need to do in my fight. My opponent is claiming he won the fight the last time, so I want to give a knockout so the people know for sure who won this one." One way or another, Pacquiao will answer all doubters this December – including the ones in his own camp. The judges won’t just give him a giftwrapped victory this time, he is going to have to earn it. Be it by knockout (unlikely) or a dominant showing that gives judges no choice but to give him the decision, the Filipino champ will either silence the critics in his next bout, or he will give credence to all of their concerns. Stay tuned, Dec. 8 is going to be very interesting. Why Do People Pretend that Timothy Bradley Deserved to Beat Manny Pacquiao? More Legal Drama: Juan Manuel Marquez’s Camp to Sue Manny Pacquiao’s?